Power! Not Panic is a series of workshops organized by the Riot Alliance, a loose collective created with my TAT-lab colleagues Sarah Fox and Dr. Daniela Rosner. 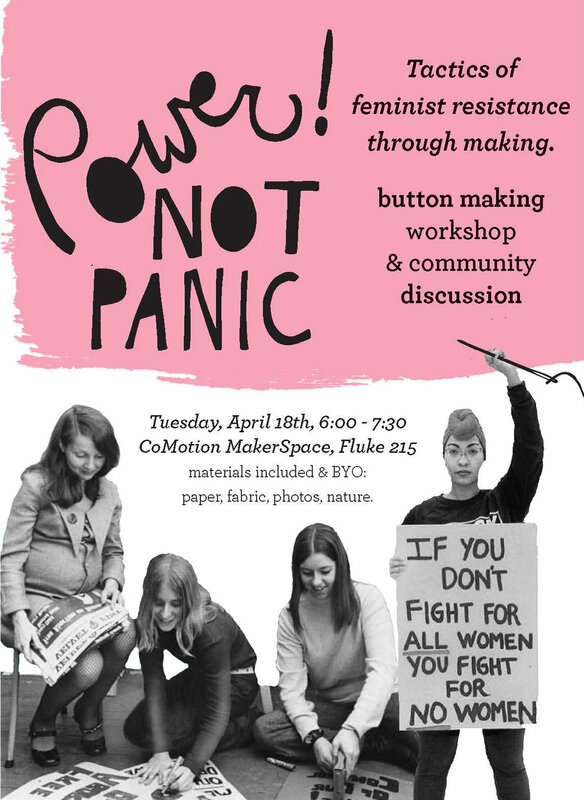 These workshops incorporate basic circuit design within protest posters, buttons, and dissident messaging. By integrating the tools of technology with the intimate and handmade, we seek to imagine different circumstances for the professional and political contexts where technology is created. Written for the "Design Inquiry" forum in the ACM Magazine, Interactions. Read here. The imperfectly executed ideas. The things we build that don't work out. The projects we begin but never quite polish into a final form. These failures are all around us. And, recently people in technology industries have talked a lot about their value. We're encouraged to "fail forward" to "fail fast" and "fail better." But, failure can be more than just learning the hard way—more than a informative experience to be left behind, in the pursuit of better outcomes. They're real glimpses of other futures. Taking these glimmers & half-built projects seriously requires new ways of valuing design projects. With my collaborators Sarah Fox and Kristin Dew, we explore what this might look like in a feminist button making workshop hosted at the UW MakerSpace. Disobedient Electronics: Protest is a zine by Garnet Hertz that is a collection of projects using DIY technologies to confront political issues. The Riot Alliance designed a sticker insert that was distributed with paper copies of the zine. Inspired by a poster making workshop we organized for the 2016 Women's March on Seattle, the sticker depicts a woman in protest holding a sewing needle in a raised fist. The full PDF of the zine can be found here.